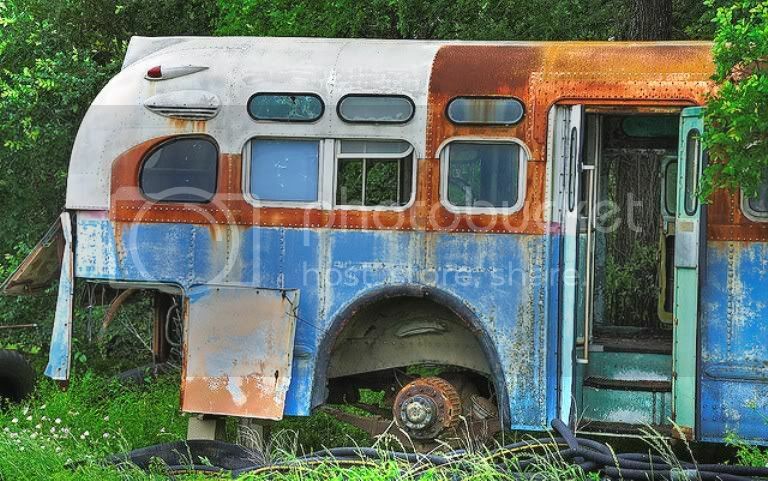 About a year after New York City received 500 1948/49 TDH 4510’s, built to NYCTS specification and the first attempt by GM to produce a 102 inch wide transit coach, a handful of the buses were found to have hair line cracks in their roofs concentrated mostly amidships in the vicinity of the exit and emergency doors – these simple fractures manifested themselves in the form of minor ceiling leaks during washing and rain storms. While GM thought of this situation as not being significant enough for recall, they did supply epoxy materials for repairs in the field and paid the city for whatever repainting was necessary but, at the same time, considered that poorly maintained streets such as those in New York might have prompted the problems. It was mid 1950 while production of the standard 4509 and 4511 models were in full swing that it was decided to bolster those apparently weakened sections of the body with the use of steel elements instead of aluminum. Pictured below (top) with thanks to ‘twelvebitphoto’ of Flickr we see an excellent example of such steel modifications and to what extent the ferreous metal was used on what is left of a 'phase II' 4509. Of note is the fact that the strengthening encompassed most of the window frame areas as well. A telltale sign of the finished product can also be seen on Green Line (NY) # 324 below by a narrowing of the single passenger windows just forward of the emergency and exit doors. Green Line photo borrowed for educational purposes only. 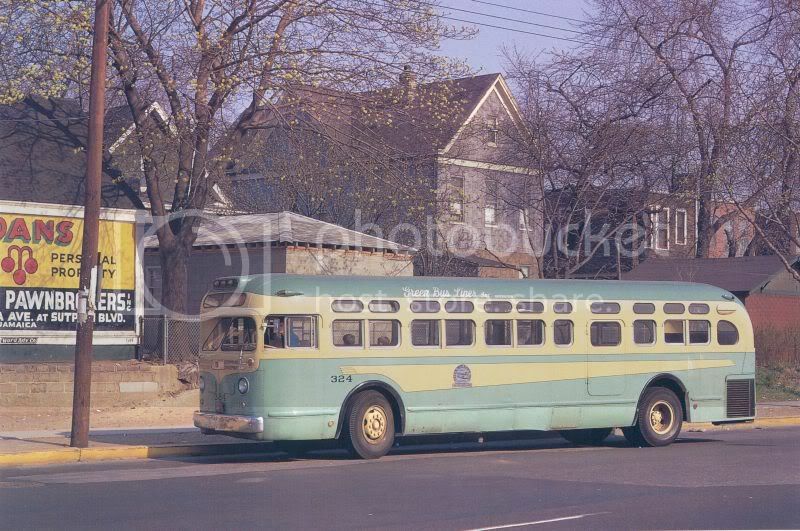 Mr. L: You never did mention the origin of the bus in the top picture, so I'm venturing a guess that this could have been one of the "Green Line" buses from the Cincinnati, Newport & Covington. The protrusion on the roof line may very well be the rear destination sign that made these buses (and other makes) unique to the CN&C! Yes, I saw the protrusion and thought exactly as you did but I didn't focus on it because of the importance of the main subject of the essay. However, if that's what it is, although it seems rather large for a rear roll sign enclosure, then it would certainly be a GM Old Look oddity. As long as we're on the subject of Cincinnati (Green Line) and oddities, take a look at the front of C N & C # 173 restoration below and tell me what you notice! Photo courtesy of Cincinnati Transit Historical Society. Other than the lack of the two vent flaps between the headlights, I can't see anything else that's noticeable. Close, but no cigar! the under windshield floor vents were standard on all GM Old Looks except where an operator opted to omit them so that is not the oddity. The oddity here is the unusual height of the front bumper and, while I'm sure that the original operator (Harrisburg Railways) had their reasons for the configuration, it did leave much of the lower sheet metal exposed to damage. Also note that the tow hooks appear under the bumper; the tow hooks were an option and some were placed under the bumper but the vast majority were found just over it. Personally, regardless of what, I think # 273 belongs in the Smithsonian with its perfect condition and beautiful livery design! For some reason the bumper didn't look right when I first looked at the photo, but dismissed it thinking that wasn't what was odd. Great point Mr. L! But then I got to thinking if the bumper was perhaps put on upside down during restoration. I have no idea what the brackets look like behind the bumper, but if they are not symmetrical with height, then this is a possibility. The only reason I question this is because, it involves two elements - the height of the bumper and the position of the tow hooks. Mr. L asked me about that on Flickr and I said the same thing. Almost looks like they put the bottom section on upside down. I'm sure I would have noticed that when that bus was County of Lebanon Transit #300, as that was my regular bus for a long time. BTW, Mr.L. I spent two hours trying to find the photo I have of the 300, with no success. 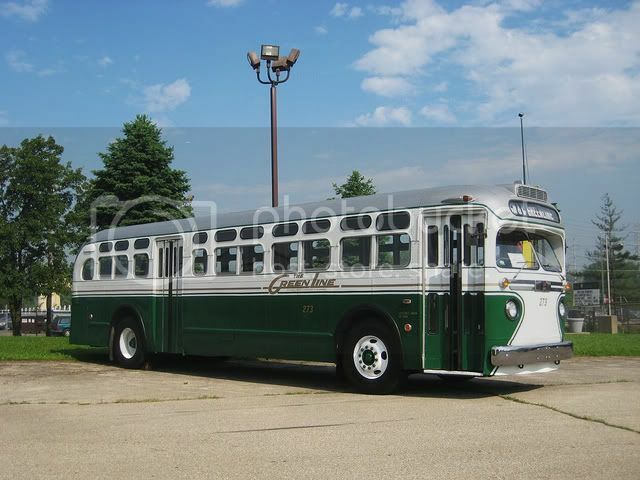 I did however find a photo you may not have of an ex-Green Lines bus. I posted it under Reading Bus Co. along with a couple of other Reading mementos that I came across.